When I started doing this I couldn’t remember anything about this gig at all. I had returned to the North East after finishing 3 years at Salford University and by 1984 I was doing a course in Opto-electronics at Newcastle Polytechnic. 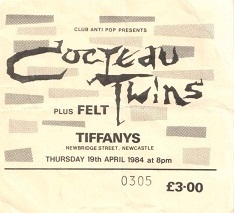 I don’t know if it was me or my girlfriend that wanted to go to this gig – or maybe it was a friend at the Poly – Kate springs to mind – that suggested it! I can’t find a ticket for this one so I assumed we must have paid at the door but having read the entry on Vintagerock’s Weblog he says that the venue was packed so maybe we did have tickets in advance. having said that he posted a scan of his ticket (shown below) and it really doesn’t ring any bells! I found the setlist and a recording of the gig!